Photo (4 x 5.5 inches) mounted to a cardboard frame/backing (6 x 8 inches). Photographer is Kuhn of Stanberry, Missouri. 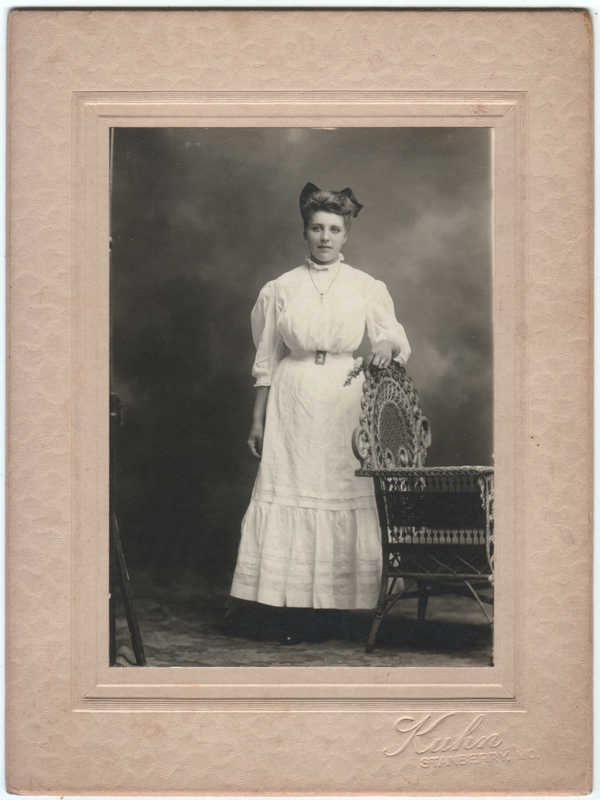 Written on the back is Margaret Elizabeth Guenther / Aunt Maggie. Since this is the fifth time I’ve posted something from the Guenther family, I figured I’d better go ahead and create a separate category for them. So you can now view them all here. I suspect there might be another family name that is part of their extended clan (maybe the Rasmussens I’ve posted, maybe the Nickersons I haven’t), but I need to examine them more carefully to find connecting clues. Meanwhile, as we set our clocks back this weekend and head into the depths of winter, here is the warmth of Aunt Maggie’s countenance to enjoy.